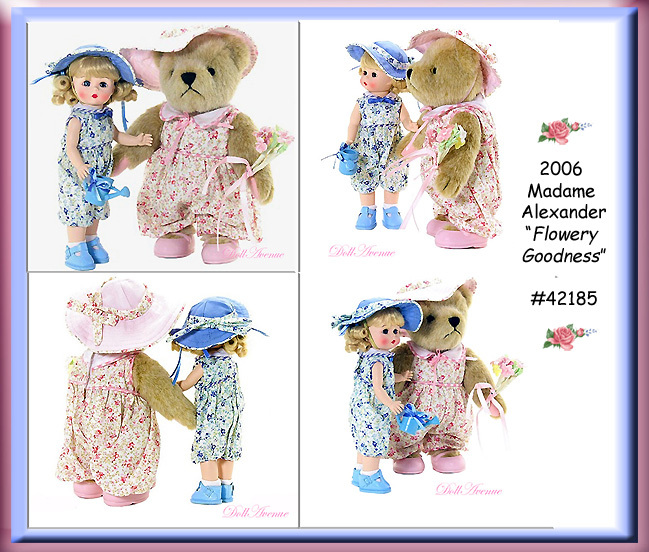 Here is an adorable Madame Alexander set called "Flowery Goodness." Wendy and her friend "Chaos" the bear are part of the Americana Collection and now retired. Wendy has pretty light blonde hair styled in soft curls. She has a pretty peachy complexion, rosy cheeks, ruby lips, and bright blue eyes! Wendy and Chaos are wearing matching floral playsuits and sunhats in the opposite colors of blue and pink. The playsuits are decorated with contrasting striped cording at the umpire waistline and along the Peter Pan collar. Finishing these cute play outfits are light blue buckle shoes and white socks for Wendy and pink side-strap shoes for Chaos. Ready for adventures in their garden Wendy carries her own little blue watering can, while Chaos has picked a lovely bouquet of flowers just for you! Condition: Wendy and Chaos are in mint condition, having never been displayed or removed from their box. They will arrive with their original hand-tag, registration card, and box.